Data mining, as per definition, is a discipline whose main aim is to discover patterns and most importantly, to predict and gain more knowledge on your data. This is done by combining different methods and approaches from artificial intelligence and statistics disciplines. One of the most common problems is how to build accurate and optimal classifier that given raw data helps us to build a model to classify future cases. There are many algorithms and methods available and we will refer in this blog article to the C4.5 which is available in the SAP Predictive Analytics tool. SAP Predictive analytics (SAP Infinite Insight) provides data mining capabilities that help many companies to anticipate customer behaviors and demands. 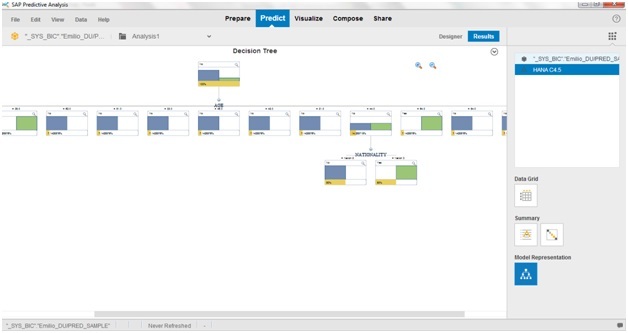 SAP Predictive Analytics is very easy to use and very powerful, it can be downloaded here. The C4.5 algorithm goal is to make decision trees based on datasets. Its first version came from ID3 algorithm which was developed by Ross Quinlan. Although C4.5 is highly popular, there are many other options like J48 and the extended C5.0. By taking a group of examples, C4.5 builds the simplest decision tree (not necessarily binary) in order to classify new cases. It establishes the most important attribute as a base and adds new nodes by evaluating the importance of the following attributes. In the example above, we can classify an object according to its attributes and get whether is a class A or a class B object. The leaf of the tree shows the result of the analysis. That is, the algorithm builds the tree by selecting the attribute with the smallest entropy possible. There are many references about the C4.5 operation and performance, but this may be something to cover in another post. Data-mining capabilities are a must for many companies. They provide an insight for the future and analyst can anticipate events or behaviors that will improve the whole decision making procedure. On one hand, SAP Predictive analytics tool will provide the user interface to build predictive models and apply data mining procedures to forecast and analyze. It is built on top of SAP Lumira, therefore is graphic-based and very easy-to-use. On the other hand, SAP HANA provides an extremely fast and powerful in-memory database. It would make sense that we can actually take advantage of this horse power and run the algorithm in HANA. HANA’s Predictive Analysis Library (PAL) defines functions that can be used to perform predictive analysis algorithms. For this analysis, we will use the following raw data. The below table represents a list of customers from an insurance company and the last column defines if it is a fraudulent customer or not. We would like to build a decision tree based on this data, that is going to help us to classify a customer to see if it’s probably fraudulent or not. Let’s assume we have a model in HANA with this data available (check how to build a model find SAP reference guide http://www.saphana.com/docs/DOC-1074) in an Attribute View Called “PRED_SAMPLE”. So First we open SAP PA and click New Document and select Connect to SAP HANA. After introducing host name and credentials, follow the process and select the view which contains the data to be analyzed and click on create. Note: C4.5 is only available in HANA PAL and not in PA itself, so it will only be available when we are working with data in HANA. After data has been loaded, we click on Predict to access the Predictive view. In the right panel we can select the available predictive algorithms and other procedures to use. HANA C4.5 should be available if we have established the connection successfully. We just have to double click and a node will be added in the composer. We don’t need any data transformation since we assume the data has been prepared before.